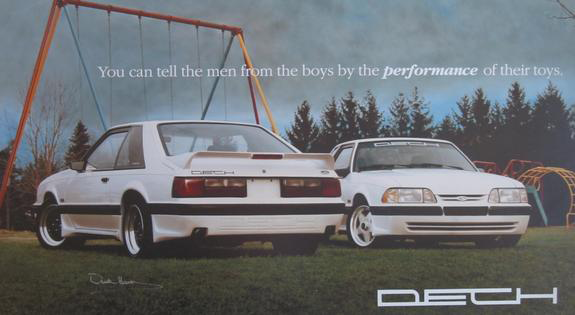 DECH Motorsport was founded in 1985 by Derek Hanson, seeking to provide an attainable high performance vehicle for racing enthusiasts, at an affordable price, the search was focused on the Ford Mustang and the Chevrolet Camaro. 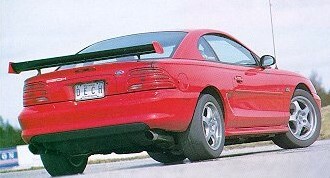 The Mustang proved to be the victor, chosen for durability, weight and value, it would prove to be the ideal candidate for Derek’s suspension tuning ability. 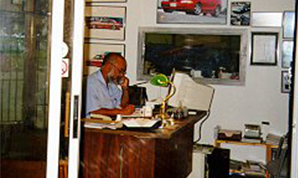 Starting out with just a few dedicated customers, DECH set out to change the face of affordable high performance automobiles throughout Canada, and eventually all of North America. Utilizing a vast knowledge of suspension, DECH set out to analyze all the performance parameters of the car, and evaluate which modifications would best elicit the desired level of handling necessary to outperform everything else on the street, and the track. Designing and testing numerous types of coil springs ( using spring rate test equipment not just seat of the pants testing ) and combing the damping attributes of Koni struts and shocks, the net result was a car that could lap the track with ease and still comfortably convey their owners to and from the course, without shattering vertebrae. These early DECH Mustangs were custom built to owner specifications, and came with a base horsepower rating of 240 HP, many were destined for S.C.C.A. road course events that DECH was soon to be dominant in. Around this same time in the United States, a man named Steve Saleen was starting to put together his own Saleen Mustangs, he had also recognized the potential of the Ford Ponycar and with a background in SCCA racing he attacked the Mustang converting it into a world class super car. Although suspension, braking and aerodynamic modifications set the car apart from the rest of the pack, the car still lacked any significant power improvements. These were to be the cars directly compared to DECH Mustangs, and many would go head to head in completion. In fact, DECH would provide Steve Saleen with a pit crew for his first race at Mosport Park (now known as Canadian Tire Motorsport Park near Bowmanville Ontatiovand DECH would use a modified version of the Saleen ground effects package on their first run of production cars for dealer distribution. Soon afterward DECH decided to invest in designing, wind tunnel testing and producing their own aerodynamics system for all future production and customer vehicles, to further differentiate themselves from other aftermarket Mustang companies. The look alone would set the cars apart from the now very popular crowd, but what lay beneath the surface would elevate the car to cult stature in the circles of performance automobiles. Regularly whipping past exotics and other performance cars at open road course events put on by DECH and other companies and car clubs. One ride around the course at Shannonville’s track with Derek or his son, and chief of research and development, Van Peter Hanson and all the potential of the cars become glowingly apparent. Continuous research and development through on track and on bench testing led the team at DECH to develop the SPEEDDRIVE Spring package, GRABBERS, Strut tower mount bearing assembly, Lower chassis stiffening member, and the DECH ASG rear suspension system, along with their own front disc braking system (unfortunately very expensive and soon outdated by the FORD Motorsport Cobra R m-2300-k package) all proving their determination to produce the best possible machine and products without re-inventing the wheel. The philosophy of the development team was ” less is more “, by allowing the car to work as designed, they didn’t need to rebalance the car for every small change applied to it – thus allowing the parts to be of highest quality since not every part on the car would be replaced and overall cost could be controlled. 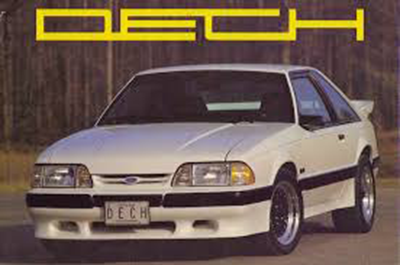 Typically the 1987-1993 DECH Mustang could be purchased for around $35,000 Canadian, very reasonable compared to vehicles of equal or lesser capabilities. Serviceable by any FORD dealer while being completely emissions legal, these performance machines became very popular on the SCCA circuit in Canada and the United States. Selling both complete cars, through their select dealers, and individual parts for customer improvement the team at DECH soon moved their sites to the new SN95 chassis of the 1994 redesigned Mustang. A briefing by Ford representatives showed all the improvements that would allow DECH to further refine the car into a total thoroughbred. New capabilities built into the car allowed the fine tuning of the chassis to a new level while keeping the drivability exceptional. A new concept was utilized in the design and production of a rear wing for the car, the AFD-IV would improve air flow around the vehicle while improving traction at speed, by eliminating high speed lift. Complementing the wing was a new splitter style air dam, the AD-I would help hold the front tires to the road and deflect air towards the front brakes. Of course it looked great as well, a selling point all on it’s own. The DECH ASG debuted on the track with this car and would soon go into full production for the 1997 product year. Customers raved about the system’s ability to control the rear axle, and the body weight transfer during braking, acceleration and cornering. Power was also an important part of the development team’s plan to elevate the car’s status. The well-known K&N air filter leads the list of modifications on all cars, DECH designed underdrive pulleys, either a Walker Dynomax or Borla cat-back exhaust system, retooled stock exhaust headers, ported stock heads, 1.6 ratio roller rockers and modified intake track boosted power on the 5.0 Liter engine. The new 4.6 L cars soon got similar modifications with the SVO/Borla side exhaust kit being very popular. A supercharger from VORTECH would further enhance power production for those so inclined. 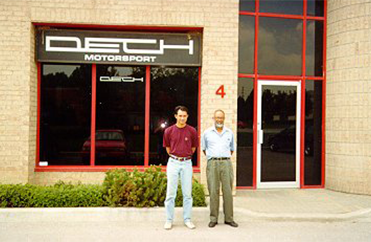 DECH Motorsport officially ceased operations in 2000.